This time of year is all about comfort food in my house. Something about the cold weather and being stuck indoors has me baking up a storm these days! I find that having my pantry stocked with baking supplies such as a variety of gluten free flours, chocolate chips, different nut butters and natural sweeteners is a great way to whip up new and delicious treats on a regular basis. I also like having fruits and vegetables such as apples, bananas, berries, zucchini and squash on hand. Once they get overripe I am able to utilize them in my baking and that way nothing has to go to waste! 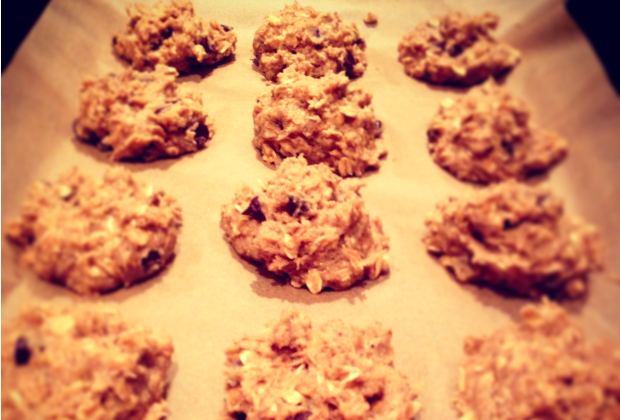 One of the things that I love about this latest recipe for Banana Oatmeal Chocolate Chip Cookies is that it is not only a great dessert, but it is filled with enough protein and nutrients to make it a healthy breakfast or snack for those days when you are on the go! Check out the recipe below and I hope that you keep warm and enjoy!!! 1) In a large bowl and using a hand blender mix together the bananas, melted coconut oil, coconut sugar, almond butter and vanilla. 2) In a separate bowl mix together all of the remaining dry ingredients. 3) Fold the wet mixture into the dry one and stir together getting out any clums. 4) Line a baking sheet with parchment paper and using a table spoon place dollops about 1″ wide on the baking sheet. 5) Bake on 350F for about 20 minutes or until the cookies begin to brown. Let cool for 15 minutes.